To find them, go to Start -> All Programs -> Accessories -> Ease of Access. Here you will find the following tools: Ease of Access Center, Magnifier, Narrator, On-Screen Keyboard and Windows Speech Recognition. 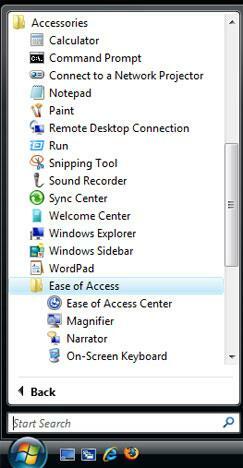 Ease of Access Center is like a Control Panel for all the other accessibility tools. If offers quick access to all the tools and plenty of adjustments options. The Magnifier, Narrator and the On-Screen Keyboard are pretty much the same as in Windows XP. 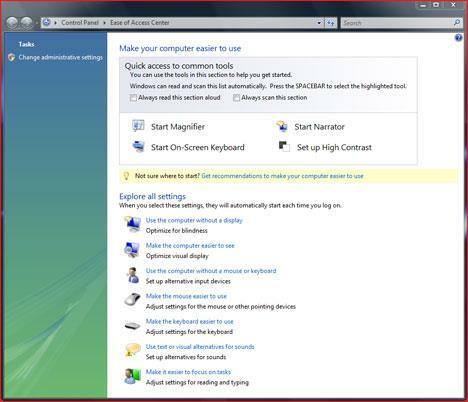 Windows Speech Recognition is a new tool added in Windows Vista. It allows users to control their computers using their voice. With it, you can say commands that the computer will respond to, and dictate text to the computer.